Editor’s Morning Note: Happy Monday and welcome back to the work week. This morning marks the kickoff of earnings season in tech, so strap in. Our main focus today is the concentration of venture capital at the top-end of the dollar curve, and what that may mean for smaller deals and younger companies. What IRR is supposed to become, before a bear market comes and takes it all away. Reports concerning venture capital’s second quarter performance paint a varied picture. As with the first quarter of 2016, different sources disagree on the number of venture deals that took place in the three month period, along with the total dollars invested. Fair enough. I ran the same calculation at Mattermark and found that using our normal methods of tracking venture investment around 33 percent of venture dollar volume last quarter went to the ten largest deals. That ratio rises to over 40 percent when I include deals tagged as private equity. That $3.5 billion Uber round is the key differentiator between the two figures. Whether you count it, that is. Regardless, from Mattermark’s data and the NVCA report, it’s fair to say that the ten largest investments that took place in the quarter took in more than a third of capital deployed during the period. Was the quarter out of the ordinary? Let’s find out. Turning to a third source, Pitchbook’s second quarter report has two charts that are worth examining in our current conrtext. 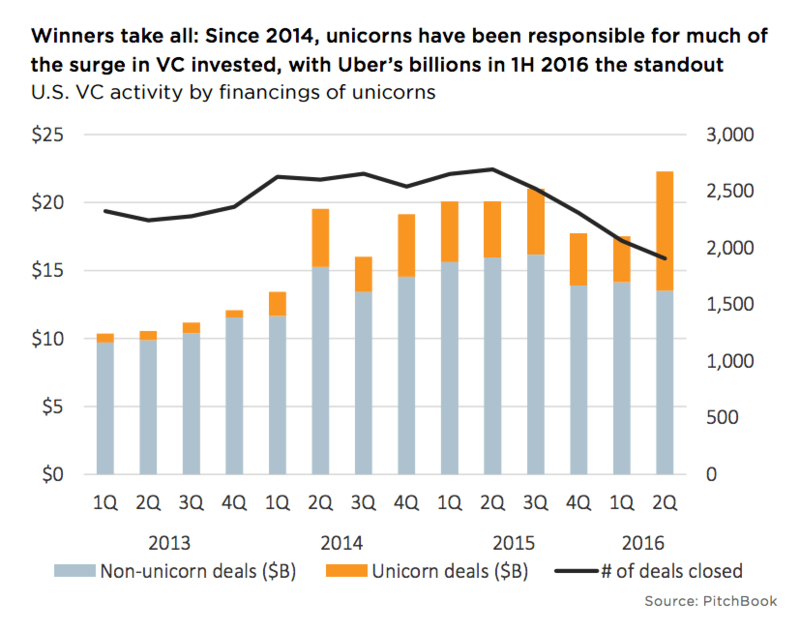 The first shows the growing percentage of venture investment that goes towards unicorns1, and the second the rise of in-ratio dollar volume of larger rounds. Eyeballing the two, it’s easy to see that the percentage of venture capital going to the most richly-valued firms is at least at a local maximum, and according to the second chart, that the percentage of venture dollars going towards later-stage companies and larger rounds is rising as a percentage of aggregate spend. The two charts confirm what Mattermark and the NVCA told us, that venture dollars are collecting in the upper-end of the startup lifecycle. That means that there are likely fewer dollars for younger startups when compared to the capital available to older startups. Other Mattermark reporting here, and here on the current Series A market agrees. Caveat your founder friends’ stories over the next few months accordingly. It’s the most wonderful time of the year: Earnings season, the excellent four-times-yearly nerd bacchanal. Setting the stage, keep in mind that US markets are near record highs at the same time as bond yields are at record lows; untangling the risk profile of record-breaking equities and their implied optimism in contrast to draconian and often negative bond yields and their implied pessimism is your own task. Valuation multiples are up across many sectors, which may imply that weak earnings reports could cause more downward motion than usual. When you are up higher you can fall further, to cite the normal cliche. Today is IBM, Yahoo, Netflix, and others. Tomorrow is Microsoft. We’ll chew threw a trillion dollars’ market cap in short order, and several more before we are done. The cycle won’t conclude until Box gives us new reference ARR multiples. Due to Box’s fiscal calendar, it reports off-sync to other companies by a month. Not excited about earnings season? Have four more cups of coffee and then come back. You’ll be excited. We are leaning on the rule of thumb ‘larger firm, larger fund,‘ which indicates that highly valued firms tend to raise venture capital in larger doses; this is a likely correct rule, but also one that we have to admit we just made up. Featured Image via Flickr user James Cridland under CC BY 2.0. Image has been cropped.